• Offer Price – While the price of the home seems to be the major point of contention in a home negotiation, the seller’s net proceeds and the buyer’s mortgage payment may actually be more critical. • Financing – 86% of buyers financed their recent home purchase as opposed to the 14% who paid cash. 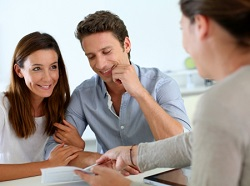 Some financing has higher fees than other types of financing and in some instances, sellers must pay the additional charges on behalf of the buyer. o Seller-paid closing costs – paying all or part of a buyer’s closing cost requires less cash outlay for the purchaser and makes it easier or more appealing for them to buy the home. o Seller-paid buydown – prepaying interest to the lender on behalf of the buyer gives them lower payments for the first one, two or three years even though they must qualify at the note rate of the fixed-rate mortgage. o Personal property – seller may agree to include existing or new personal property like washer, dryer or refrigerator. o Improvements – seller may agree to make modifications to the existing condition of the home like floor covering, countertops, appliances, painting or other things. • Earnest Money – more money gives the seller a sense that the transaction is more likely to close while putting the least amount at risk is generally, more appealing to the buyer. • Timing – depending on which party is more flexible, sometimes an earlier or later closing or a position on occupancy can be an offsetting consideration that can balance the differing terms. • Contingencies or lack thereof – requirements that must be satisfied before the contract can be closed.